I’m not much a soundtrack fan. I mean, I like movie soundtracks while I’m watching movies if they’re good (Inside Llewyn Davis and Gravity being two great, but very different, ones from last year, for example), but I don’t buy the soundtrack albums much, if ever. I’m sort of hard-pressed to think of very many that I own or have owned (since I sold all of my CDs two years ago, I don’t own much of anything any longer). 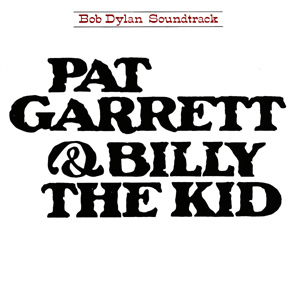 I would guess that the soundtrack for Pat Garrett and Billy the Kid is now one of a very few. I’m not surprised to read that this was a disappointing release for Dylan fans. For one thing, it’s short. “Main Title Theme” to “”Final Theme” runs only 29 minutes. There are the two extra versions of “Billy” that round it out 36 minutes, but that’s only a minor attraction since there are four different versions of the same song on this album. That’s a lot of repetition. Further, only two songs “Billy” (in three of its versions) and “Knockin’ on Heaven’s Door” have vocals other than the humming/moaning that can be found on “River Theme” (which I actually sort of like). For someone who hadn’t released a full album in three years, this had to annoy the fans. I mean, even Greatest Hits v2 had more new Dylan music on it than this did. This was Dylan’s first soundtrack, and a lot of it is very ordinary. I still haven’t watched the film yet (tonight! I hope!) but “Cantina Theme”, “Bunkhouse Theme”, and “Turkey Chase” are all pretty conventional for the western genre. The instrumentation is very good to excellent (Bruce Langhorne and Roger McGuinn on guitar will help a lot with that), but it doesn’t attempt to push the boundaries at all. “Knockin’ on Heaven’s Door” is, I think, an absolutely fantastic version of that particular song. Having listened to it a lot over the past couple of days, I’m starting to think that no one has done it better than it was done here. For such a well-covered song, you’d think someone would be able to make an advance on it, but I’m not sure that anyone actually has. That leaves us with “Billy” in its many varieties. I had never heard this song before this week, and I’ve really come to love it. I think that this is an underrated gem. “Billy 1”, which is the version used in the film (I take it) sounds like it’s a really great match for a Peckinpah film and the instrumentation matches best with the other instrumentals. My favourite, however, is “Billy 4”, which is considerably longer and has a ton of extra verses. Dylan is about to move back into his phase of long story songs (“Hurricane”, “Isis”, “Tangled Up in Blue”) and this hints at that. It’s really straight-forward and direct, but it’s also quite evocative. I’m not sure that the best choices of verses was made for “Billy 1” (though the harmonica playing that opens that song is really strong). “Billy 1” uses just the first three of the song’s nine verses, and the lyrics don’t come in until 1:34 of the 3:55 song (they do two verses of harmonica – it’s some of his better playing, and it also ends with a harmonica verse). Interestingly, the lyrics do not exactly match those copyrighted on his website: there’s some changes to the third verse. “Billy 4” is a fuller version, with an average harmonica piece in the middle. It is far more plaintive, and I like it a lot better as a stand-alone song. If you tacked the opening of “Billy 1” onto “Billy 4” the whole thing would be awesome. The lyrics here differ wildly from the copyrighted version. It swaps the order of verses three and four, uses totally different lyrics in most lines, and skips verse six, using it only at the end. Although on “Billy 4” the final line is “To be hunted by a man who was your friend”, which is infinitely superior. On none of the three versions does he sing the lyrics to this verse as they appear on his website. “Billy 7” is too much a dirge for me. It sounds like a rehearsal track, which it likely was. It begins with verse three (where he adds a “doggone” to the final line. “Doggone” never improves any song), and then jumps to verse five and then finishes with a verse that isn’t in either other version, nor on the copyrighted lyrics. I think I have to track down “Billy 2, 3, 5, and 6” (at least), because the evolution of this song seems pretty interesting. The official lyrics are, at best, an approximation of some sort of Platonic version of the song that doesn’t seem to have ever been played. I think that the various versions of it make this an interesting album, but I’m not sure I would have loved it in 1973.